Part of the problem with the COLLINS class was that the then ALP government decided to "slim down" the services and a lot of middle-ranking officers - the ones who actually managed the building of the class and other projects were forcibly retired. These men (and I assume women) were enbittered by the experience and some of them went to the media - particularly Uncle Rupert's rags - and bleated out all they knew about the troubles of the program. The result was an ongoing battle against old information which was rapidly outdated by the various "fixes" and upgrades that the class underwent during their early life. Then there was the Navy own management problems. Their lack of crews have largely rendered the class halved AIUI in numbers. The idea was that the six would have two on operation, two in training and two in refit at any one time. Problem was the mining boom made the idea of being submarine crew unpopular and the crew decamped to the mining sites to earn twice as much and to spend half as much time away from home. This, plus the poor management of the boats themselves meant that they were often than not alongside, rather than at sea. As Volkadov has mentioned, the boats have become the best conventional submarines the world has thus far seen. They are quieter, longer ranged and faster than most conventional submarines and have earnt the RAN kudos from all our allies which have exercised with them. Here's something that struck me today. Commonwealth Aircraft seems to have developed a relationship with North American, building first the Mustang, then the Sabre. 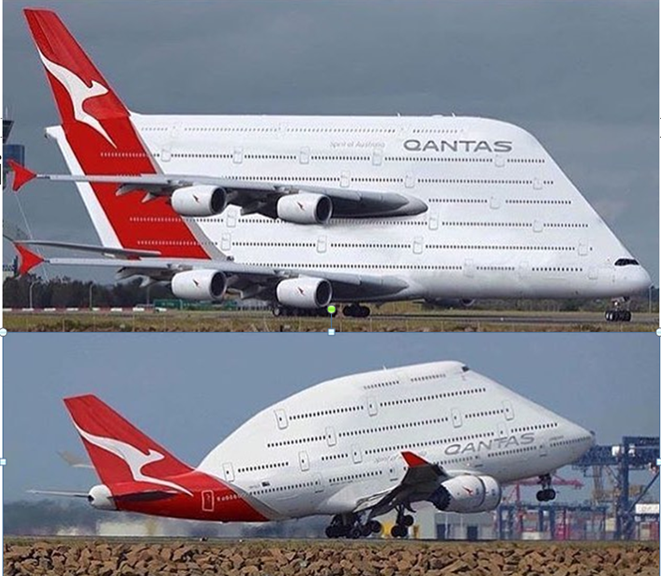 What if that went further, and they ended up building a sequence something like this for the RAAF and RAN? Sapphire Sabre (RAN): basically an FJ-3 Fury with a UK-spec Sapphire (licence built) instead of the J-65 and 2 x ADEN cannons. 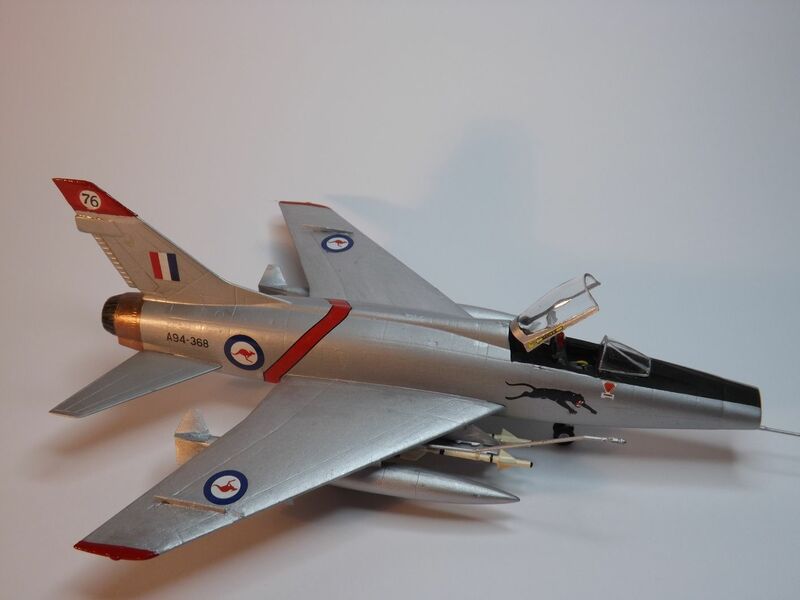 Sapphire Sabre (RAAF): ulitmate fighter version, basically the RAN fuselage with a non-folding 6-3 wing and a shorter nosewheel. F-100D/F Super Sabre: possibly with developed Sapphire or Avon engines. T-28 Trojan: sensible choice of basic trainer if you've been producing Mustangs. T-2 Buckeye: jet trainer for both RAAF and RAN. OV-10 Bronco: for use in Vietnam? F-107: Super Sabre follow-on with radar, original chin intake and no recessed nuke, possibly with an Olympus engine. This would be bought instead of the Mirage. A-5 Vigilante: Canberra replacement. I know the RAAF evaluated it and didn't think much of it compared to the F-111 & TSR.2, but what if CAC were offering a version more adapted to conventional strike? Linear bomb bay replaced with permanent, space-efficent fuel tankage, clipped wings for low-level work (basically take the folding bit off!) and fuselage pylons? If you actually look at the timings most of the build work and the discovery of the teething issues actually occurred after the Hawke Keating years and the downsizing of the naval engineering capability began as part of the tail to teeth rebalance under the new government when older more manpower intensive platforms were retired without replacement. Basically Australias defence forces went through what those in the UK did a decade later when centre right governments replaced very long serving centre left ones, every project that could be stopped or scrapped was, capabilities were retired without replacement and future development was virtually put on hold while the new government strived to undo over a decade of their predecessors legacy, often throwing the baby out with the bath water. With the exception of the combat system the problems with the Collins class were teething problems similar to those any new class suffers, teething problems that had mostly been addressed by the second and third of class. The third boat was used for trials for many of the systems to be incorporated into the remaining three boats, that had been deliberately delayed to incorporate these changes that were upgrades rather than fixes. A smart operator would have simply ordered an evolved second batch or flight, it would have cost less, caused less disruption, brought the RAN up to the long acknowledged required strength of at least eight boats as well as firmly establishing the local building capability and progressing the design capability, leading to the order of a replacement class or third batch by 2010. Unfortunately we didn't have a smart operator and problems that were clearly those of overseas suppliers were blamed on the Australian builder. The combat system was the biggest problem, it was directly contracted by the commonwealth and the builder had no control over it whatsoever. ASC formed their own CS group to try and integrate Rockwells abomination but as the basic architecture was never stable, let alone capable, this was not possible. ASC warned the government dept of defence on multiple occasions, even demonstrating the systems instability and Rockwells violation of contractual conditions to no avail, they continued to receive progress and mile stone payments for a product that was not evolving and not meeting milestones. The issue there was Rockwell was a company that had never done a submarine CS but wanted to get into the game so they subcontracted Singer Librascope and Sperry to do the work. The subcontractors did precisely what they were contracted to do and nothing more then walked as they had no interest in establishing a competitor on the market. Rockwell, clueless and having promised the impossible failed to acknowledge that they had no idea how to deliver the contracted systems and simply pushed along assuring defence that all was well, even though ASC and the RAN project staff were reporting otherwise. You see a major global corporation would never lie or let you down, so it must be ASC telling porkies. What Rockwell promised back in the late 80s with 286 type processors, can still not be achieved in 2016. That would be very logical particularly the North American tie in. Another that would work would be De Havilland, which build a and assembled a range of aircraft in Australia before and during the war before their major projects to deliver Mosquitos and Vampires the RAAF. These could quite reasonably have been supplemented by local production or assembly of the Hornet/Seahornet to fill the RAAF long range fighter requirement as well as providing reconnaissance and night fighter versions to fill gaps in the RAAFs and RANs order of battle. 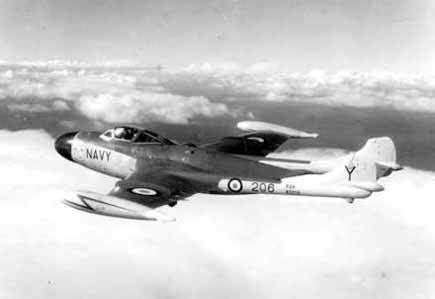 The Venom/Seavenom could have followed as could the Seavixen (or even a land based Vixen) into the early 60s. Another idea I had was that considering the size of the RAAF flying reserve it actual Mustangs, Vampires and Meteors could have been supplemented by night fighter variants, i.e. two or three day fighter flight and one or two night fighter flights per squadron. Instead of scraping the flying reserve it could have continued and instead of using handmedown aircraft it could have been reequipped with types specifically tailored to their requirements, i.e. every SAAB combat aircraft from the Tunnan onwards. I recall reading somewhere that CAC was to a degree agnostic and while they had their favourites they were prepared to modify and build pretty much anyones designs. Assuming that the P.1081 actually got up, even as a naval fighter, we could have seen them move on to the Hunter then radar equipped, supersonic and navalised variants of the Hunter. The same could have happened with Grumman had they been able to acquire the F9F Panther pattern airframe they desired, leading to ADF Cougers, Tigers and Super Tigers. I was slightly surprised to discover that Australia didn't have Vampire NF.10 night-fighters, to be honest. They'd be perfect for your Flying Reserve idea since they're basically a T.11 with a radar. If CAC was building Sapphires for the Sabres, another thing they might do is go for the Javelin for the all-weather requirement. Not saying that would be a good decision with 20/20 hindsight, but it would make industrial sense. The A-5D ('D for Down-Under' ) would be such a huge investment that the RAAF would probably cling to it for grim death, much as they did with the F-111s, upgrading it time and time again until they literally fell apart. The ultimate arbiter of the type's service life would be who else bought it, and therefore how many spare airframes would be available, and with what support. Err...it started before the Mustang: The CAC Wirraway was a development of the North American NA-16. Part of the reason why CAC had such a close relationship was a combination of NA being willing to licence their technology and also their having technology that was leading edge. 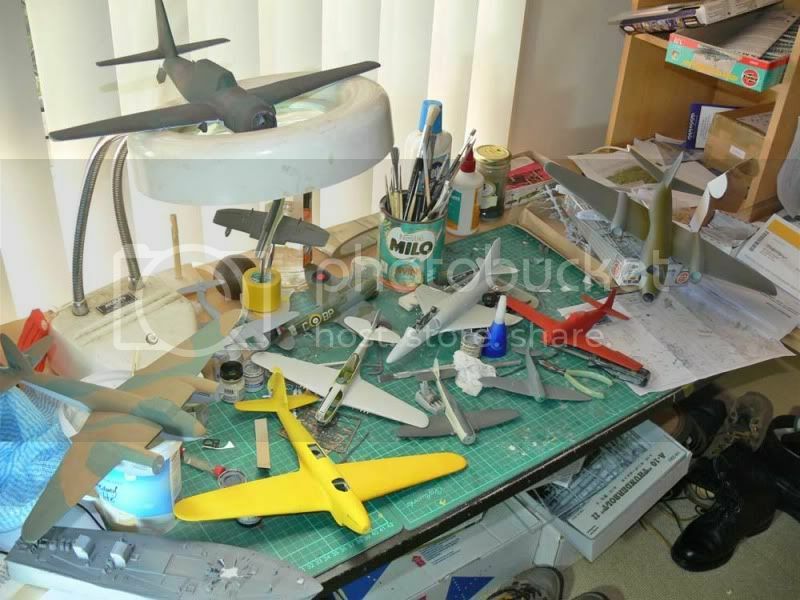 Great idea - in fact, it is sometimes bewildering why the F-82 wasn't adopted by Australia post war. On the "To be built" list! 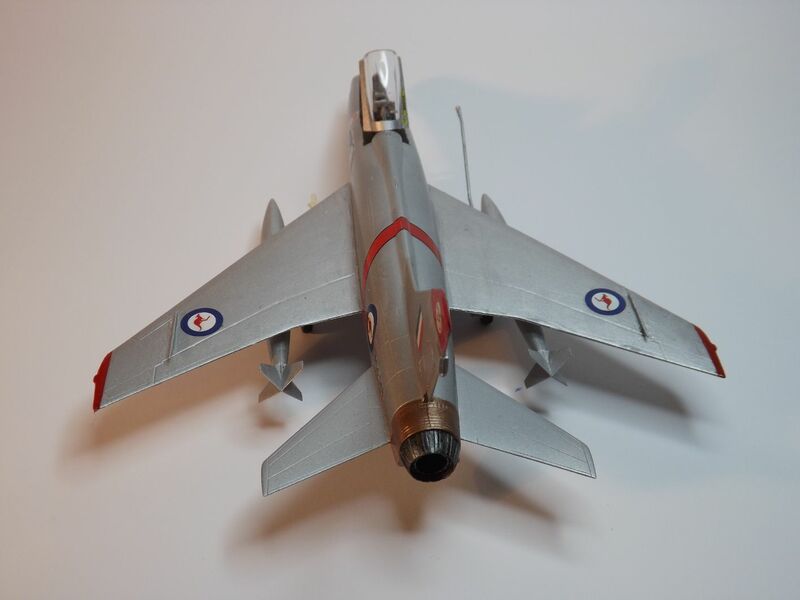 Well, we went with the CAC Avon Sabre which had the Rolls-Royce Avon Mk 26 engine, which had roughly 50% more thrust than the J47, as well as 30 mm Aden cannons and AIM-9 Sidewinder missiles so why bother? I would prefer to go with a naval version of the Avon Sabre though. Another possibility - one probably needs for the standard Sabre to be taken out of the picture though...maybe CAC really plan to do the F-100 but do the standard Sabre as an interim measure while working unto the F-100? A carrier based version could definitely be interesting. Maybe instead of MB-326H? Roulettes Buckeye anyone? Definitely - especially given Australians flew in OV-10s on exchange there. Maybe, though suffering same issue as with F-100 above. Maybe the F-107 is introduced as an interim Canberra replacement rather than Mirage alternate? One of my personal preferences is for the RAAF and RAN to share designs wherever possible This may influence many choices. Time, basically. The RAAF didn't get the Avon Sabre until 1954, too late for Korea. Had a perfectly standard non-developmental Sabre been put into service in 1950 or 1951 as an emergency measure, the RAAF in Korea would have been materially better off. As for the F-86K, well this is the export version of the radar-equipped Sabre-Dog, so a totally different mission. I must admit to being slightly puzzled that Australia doesn't seem to have adopted any jet night-fighter in the 1950s: was there no requirement, or was it just too far down the list? Primary reason for going this route was to avoid re-inventing the wheel: if NAA are already adapting a much more powerful engine to the Sabre, then why not simply go with them? Since the Sapphire and Avon wre interchangeable in many installations anyway, Aus could probably have an 'Avon-Fury' if they really wanted one. 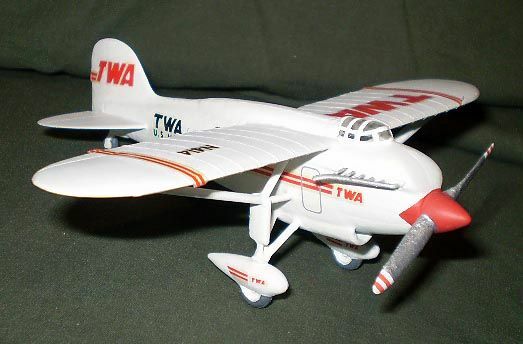 I went for the FJ-3 rather than the FJ-4 specifically because it's more of a fighter and more like the CA-27. The FJ-4 was more of a strike aircraft in practice. I think that, looking at dates, the Super Sabre is an alternative to the Sapphire Sabres if anything. The RAAF and CAC would have an interesting decision to make: go for an 'Aussie Sabre' development of the F-86F with low risk but limited potential or jump ahead to the genuinely supersonic F-100, thereby betting the farm on something much more developmental and likely to suffer from problems? It would be realistic, if not satisfying, for a muddy compromise to see both happen. 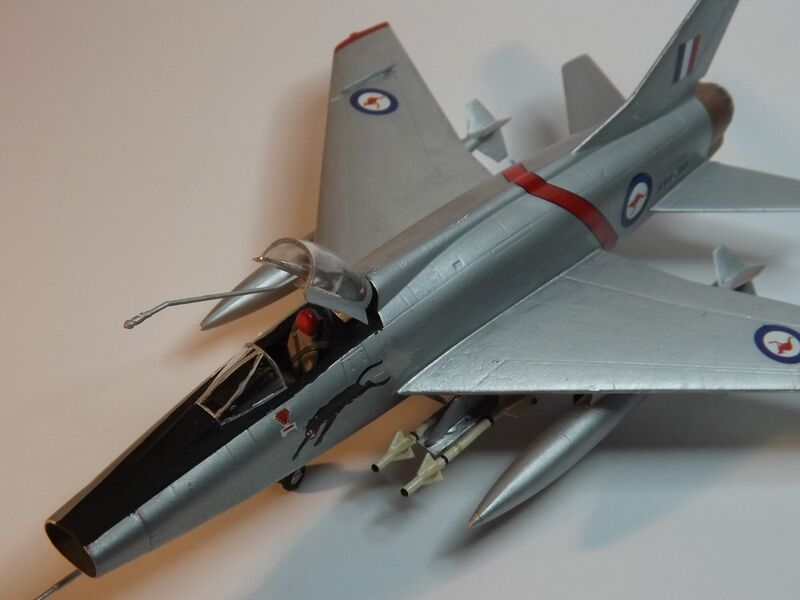 The RAAF want to go straight from the F-86F to the F-100, but when the development problems with the latter become apparent, it all gets political and CAC's offer of the Sapphire Sabre as a safe interim buy is forced on the RAAF against their will. The problem then is that they have too many new aircraft all at once in the late 1950s, and are therefore forced to keep flying the F-100 and Sapphire Sabre into the early 1970s when they'd really rather have switched to something like the Mirage with radar and Mach 2 capability. The intake went dorsal when the ventral intake was shown to interfere with the semi-recessed tac nuke they planned to carry. I can't imagine it improved high AoA capability though, which is why I suggested the chin intake for a non-nuclear fighter-bomber version. it would also be more sutiable for an AI radar too. The Aussie Mirages were actually bought in two different standards originally, one interceptor and one strike, so you might imagine the F-107 doing both roles too. Did Australia have, or have access to, tac nukes for it's Canberras and F-111s? It gets tricky when you're trying to reconcile the RAAF's very long range strike requirement and the RAN's tiny carriers though. I'm not even sure that you'd get a Crusader onto a Colossus/Majestic safely: the F-8(FN) mods only barely allowed it to operate from the larger Clemenceaus. Take a second-hand Essex from the USN? How about buying the newly-refitted Victorious after she was surprise-decommissioned? Buccaneers and Crusaders would be a tasty option. For any option, purchase and operating costs are obviously going to be a big deal, but also, what about manning issues? 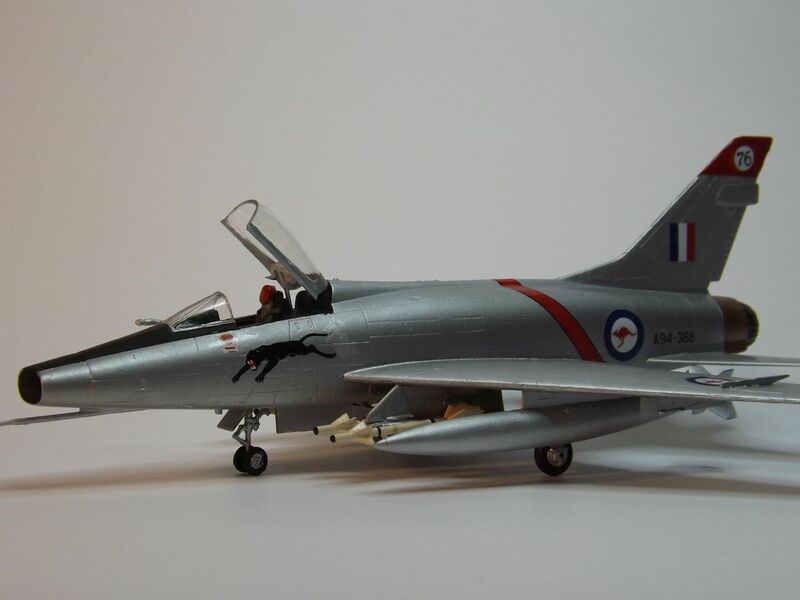 Fair enough - I suppose one option is definitely that the RAAF get standard F-86s early one perhaps even as a lease or similar pending delivery of the proper CAC Super Sabre based on the F-100. The closest that we came (beyond drawing board projects) was the De Havilland Sea Venom F.A.W. MK 53 that entered service with the RAN in '56. All those options would be valid. Another would be if the late '60s offer of the Centaur-class Hermes as a replacement for HMAS Melbourne. maybe CAC really plan to do the F-100 but do the standard Sabre as an interim measure while working unto the F-100? A carrier based version could definitely be interesting. Then, too, there's the FJ-5 proposal that's a navalized J79-powered half-way development between the F-100 and F-107 (simple pitot dorsal intake). That would look good in RAN markings and perhaps make way for other J79-powered aircraft (to the frustration of the French, the Australians decide against the Avon-powered Mirage but go with a modified, J79-powered one instead with considerable export potential (Japan, perhaps?). Thanks for posting those again GTX and Rick, love your Alt Aussie work. On the larger, better carriers I have long been a fan of Australia acquiring and modernising the Implacables. The RN apparently was looking to getting the RAN to crew them during WWII due to their manpower shortages and it wouldn't have taken much to have sent sufficient Australians from the Empire Air Training Scheme from Bomber Command to the Fleet Air Arm (that actually had very large numbers of New Zealanders) to provide the air wings for the two ships. My thinking is due to their limited hanger height the RN could recommend the British government gift them to Australia in exchange for having an extra two or three Centaurs, another pair of Audacious, or even a couple of the Maltas completed instead. This would initially be ideal for Australia as the ships could operate perfectly good enough F6F Hellcats and TBF Avengers (according to AGRA there were very large numbers of Hellcats and other USN/FAA types, pre-deployed to Australia to support allied fleet operation, remaining and subsequently destroyed. These aircraft could be acquired for a very low cost and, due to the large numbers involved, retained in service, through cannibalisation, well into the 50s. This is where it gets interesting, Australia could economically upgrade these ships during the 50s with an angled deck, steam catapults and Mk6 3" replacing the original 4.5" BD twins, converting the lower hanger into workshops technical stores etc. but keeping the original full length 14' high upper hanger. The ships were still fairly new and hadn't seen tha same hard war service as the earlier armoured fleet carriers so the machinery should still be good though they would likely need additional power generation, maybe diesel generators installed in the lower hanger or enlarged deck sponsons. The 14' hanger can be retained because Australia develops a navalised Hawker Hunter and improved versions there of, initially as a fleet fighter then strike aircraft and then supplements it with supersonic evolutions of it. Alternatively the Grumman Tiger could be acquired instead of the super hunter or as a supplement with the Tiger then super tiger filling the FAW role and the Seahunter then Super Seahunter becoming the primary striker. Helicopter of choice for utility, CSAR and eventually ASW would be the Karman Seasprite, simple because it fits in the hanger, same for the Fairey Gannet. Similar in size to the Essex Class their major limitation was their hanger height and the expence of rebuilding them. By carfully selecting or developing aircraft this could have been over come and the ships could have easily served into the 70s or 80s and perhaps even the 90s. In response to the threat posed by Communist MiG-15 jet fighters in Korea, it was decided to rapidly equip No. 77 Squadron with F-86 Sabres. This prompted CAC to investigate possible production of the Sabre as a replacement for the CAC Mustang and DHA Vampire. Initially a developed version of the Sabre with a RR Avon is considered however during discussions with NA, CAC become aware of the Sabre 45 development of the F-86. This is a much more advanced supersonic platform and later becomes the F-100. CAC signs licence to also produce in Australia using the RR Avon engine. It is introduced as the CA-27 Super Sabre. I thought the Hunter had been looked at for naval use and deemed unsuitable for various reasons? Given the level of capability CAC had in the 1950s, they could have adapted a carrier type that didn't fit in the Implacables' 14ft hangers originally to do so for the RAN by designing their own folding fin or double-folding wing modification. The Grumman Tiger would be an excellent choice: it's fin was low enough to fit in the hangar without modification and it's 'wing fold' was just down-folding tips that reduced it's span to just 1'4" more than a Skyhawk. You could get around the anemic engine problems by using a licence-built UK-spec Sapphire in place of the J65, or using an Avon instead. 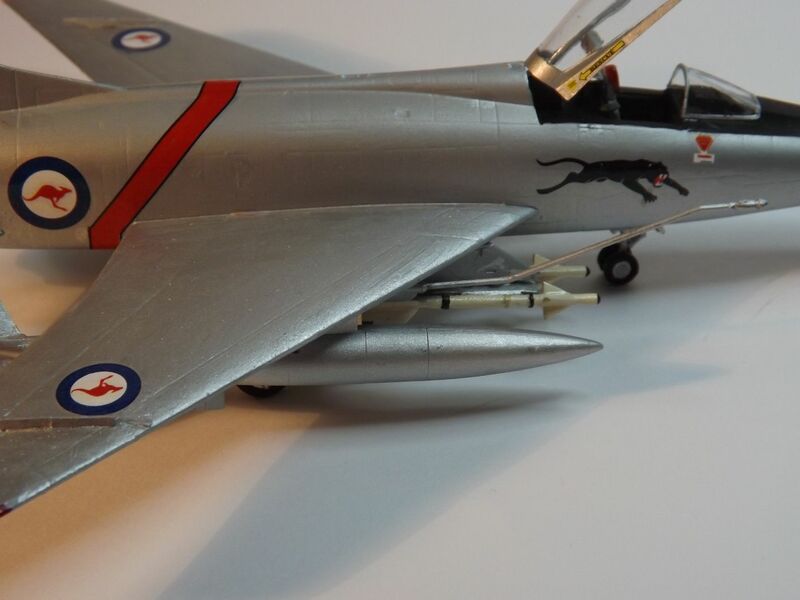 An Avon-Tiger was offered to the Luftwaffe in competition to the Starfighter, and it might make a tasty Mirage alternative for the RAAF too.